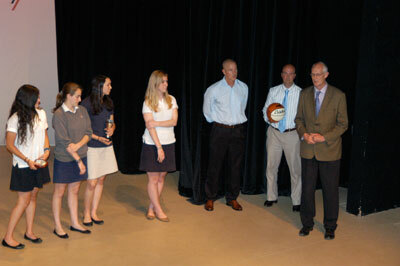 Mr. Bett commending the girls basketball team for the most successful season in TASIS history. The Varsity Sports Awards Presentations took place in the Fleming Theatre on Wednesday afternoon featuring highlights of a most successful year for the TASIS sports teams. The Most Valuable and Most Improved Player awards were presented, and congratulations to the Terrence Glynn Memorial award recipients, the sportsmanship award for underclassmen, Christine Dominas and Timothy Davison. Thank you to the team members, coaches, and the many parents who attended what was a most enjoyable celebration of TASIS sport.